Form round patties and dehydrate overnight on a mesh, or use as a paste. 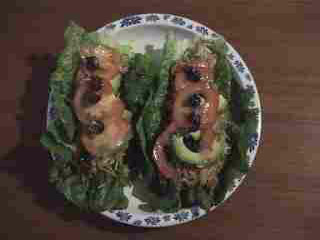 Use in lettuce wraps (roll in a lettuce leave with anything else you wish for, for example, avocado, tomato and cucumber). 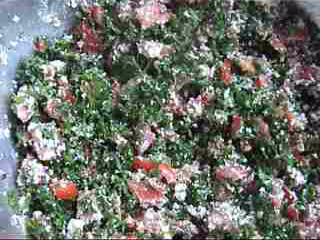 Fill the tomatoes halves with this mix and serve. 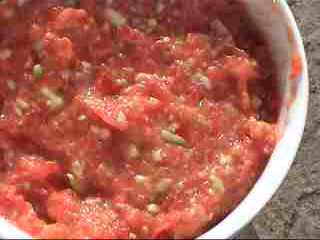 Use the leftover salsa to spread on a pizza base or with lettuce wraps. 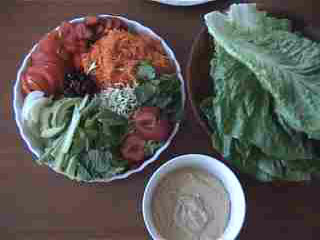 Place a spoonful of the burger paste on a small Cos lettuce leaf and roll it up. Done. 1 c of almonds (measured before soaking), soaked in water overnight, and blended in food processor. You can serve it with flax-seed pizza topped with avocado and cucumber. 1 T seasoning of your choice. 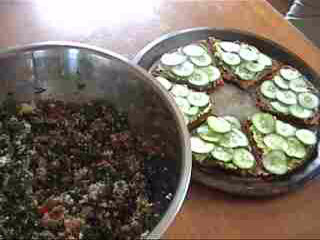 Make a paste, or form patties, dip them in ground flax seeds and dehydrate overnight in a dehydrator, on a mesh. Put tabouli, cut up avocado, fallafel and tahini on a lettude leaf, and roll it up. Luke says that these are better than the cooked fallafel rolls he used to love. This one is simple. Think stir-fry but do not fry. I used olive oil blended with a bunch of coriander and 1/2 t of curry powder. Then I diced my favourite vegies of the moment (mushrooms, broccoli, bok choy, red bell pepper and forgot what else), marinated them in the dressing and that is that! This is another, self-serve version of lettuce shells. 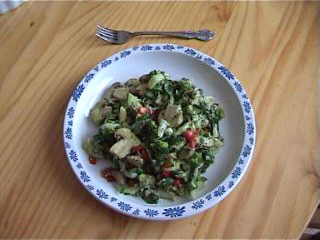 Place a range of cut up vegies (for example: zuccini, carrot, tomato, onion, avocado, cucumber, sprouts, mint and coriander leaves) in a dish, some sauce to go with it, lettuce leaves and serve. Below is a simple variation on the topic. Great for kids, who naturally prefer less complicated foods. 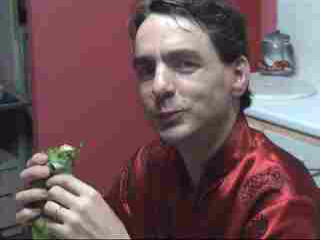 This is Julia's favourite. On a lettuce leaf (choose a young, soft lettuce, and a small-medium leaf, good for small hands; our favourite is baby Cos lettuce), spread some avocado and a thick slice of a tomato (nice, ripe red one). Roll up. Yum! 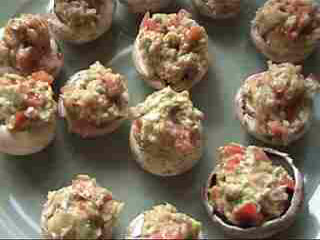 Fill the mushrooms with salsa and serve. 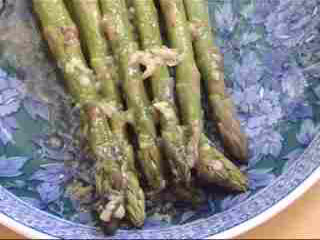 Blend olive oil, lemon juice and garlic. Pour over aspargaus. Copyright © Dr Gosia O'Reilly. All Rights Reserved. Quotes on raw foods by fellow raw foodists. Other quotes from The Quote Garden.